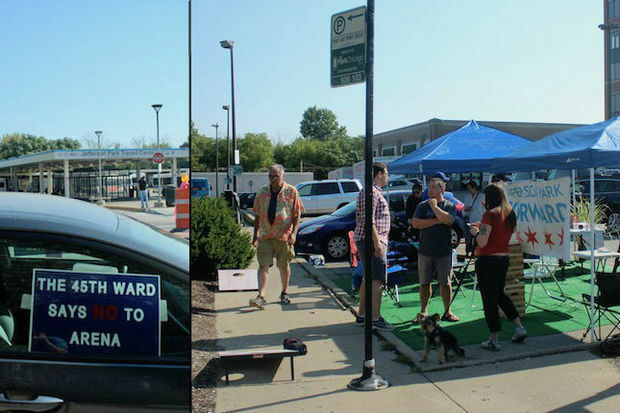 Jefferson Park Forward members moved their event to Veterans Square to avoid signs that had cropped up outside the Jefferson Park Transit Center, where they had planned to hold "Parking Day." JEFFERSON PARK — Members of the neighborhood group Jefferson Park Forward planned to take over a handful of parking spaces outside the Jefferson Park Transit Center for a picnic spread Friday, employing what group president Ryan Richter described as a "kind of guerilla tactic" aimed at nudging neighbors to re-imagine parking lots as pedestrian plazas. But the event was thrown askew by opponents of Ald. John Arena (45th), who launched their own guerilla offensive. Neighbors parked eight cars along the planned site of the event, planting signs in their windows reading "45th Ward says no to Arena." Other signs read "45th Ward says no to Martwick," referring to State Rep. Robert Martwick (D-Chicago). In response, Jefferson Park Forward chose to relocate down the block, they said. Arena's staff took no part in planning the picnic, which was part of "Parking Day" — an annual multi-city event launched more than a decade ago in San Francisco to encourage the creation of more public spaces, Richter said. But the second-term alderman has steadily pushed to open more space for pedestrians and cyclists across Jefferson Park, often at the expense of drivers — an agenda wholeheartedly endorsed by members of Jefferson Park Forward. "People do value parking here, but we have a lot of it here in Jefferson Park," said Susanna Ernst, a Jefferson Park Forward board member and one of the event's organizers. "And realistically, I don't think we need it. We've been sitting out here all day on a peak traffic day, and there have been empty spaces the whole time." Event organizers on Friday laid artificial turf over the pavement, then played lawn games, inviting passersby to write the names of their favorite neighborhood hangouts on folding chalk boards. "The goal is for us to get community members to be talking about more creative ways to be using urban space," Richter said. "We're not necessarily saying there shouldn't be parking here, but we wanted to highlight just how much of our community space is devoted to cars." After organizers saw the cars parked with protest signs in the windows outside the transit center early Friday morning, they decided to move their setup next-door to the Veterans Square parking lot to make clear that "it's not a political event," Richter said. But the residents who parked the cars with the signs criticizing the aldermen — who didn't remain on-site during the Jefferson Park Forward event — said they had intentionally left spaces open along Milwaukee Avenue so as not to disrupt Parking Day, according to a source close to the protesters. “We wanted an opportunity to show that while JPF is out there, there’s a whole other side in the community that’s upset with the overall density agenda,” said the source, who asked to remain anonymous. "Residents are rising up and joining forces to take back our neighborhood." Arena has encouraged the development of a cluster of new multi-story apartment buildings in Jefferson Park since his 2015 re-election, citing a need to increase density and breathe life into the neighborhood's downtown business district. The most recent proposal, to build a 100-unit mixed-income apartment complex at 5150 N. Northwest Hwy., has been controversial enough to spawn two new neighborhood advocacy groups all on its own. Colleen Murphy, a board member of the Jefferson Park Neighborhood Association, stopped by the event on Friday morning to chat with organizers. Murphy and other association members have been fierce and consistent critics of Arena's development agenda, but the group had no involvement in Friday's silent counter-protest, she said. "No one is ever trying to disrupt the events we put on, and we would never try and get in the way of someone else's First Amendment right to be out here," Murphy said. "And as far as parking goes, I think that's an issue where everyone's opinion can be met if we work together."